When looking for cardio and strength commercial fitness equipment, there are several choices to make. Do you want new or used, light commercial or commercial, Treadmills or Ellipticals, Precor or Life Fitness? Our cardio and strength series pack a serious punch where we have some of the best inventory the market has to offer. Brands like Stairmaster and Hammer Strength have relied on Gym Pros as a preferred retailer and wholesale distributor to deliver both high-end fitness equipment as well as great warranty and service agreements. Our Commercial Fitness Equipment Packages can be brand specific or mix and matched due to the square footage of your facility. These gym packages can be catered to anyone from a 500 to 100,000 square feet of space! By purchasing in high quantity (and all from one place) you receive massive discounts on shipping as well as a per unit cost. We also offer international shipping and financing on gym packages whether you are ordering 3 or 100 units. Here are some specific brand examples for smaller facilities but as they scale, shipping costs will go down as will MSRP discounts. If you are looking to outfit a center you can choose one of our designated packages such as that from Precor. 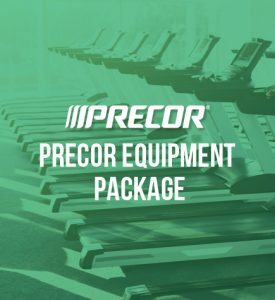 The Precor Equipment Package Features their top-selling models of Treadmill, Elliptical and Adaptive Motion Trainers. Precor is most well known for their innovative elliptical technology that made the running motion viable again to those that were forbidden by their doctors to ever think about the motion. They had such great success with the original Precor EFX 544 that they quickly branched out to several different variations of their product which then got into a more robust ramp as well as upper body motion to fully engage the core all with zero impact. Star Trac Health & Fitness was formerly known as Flex Fitness and changed it’s name after being acquired by Star Trac UK Ltd. The company is based in Irvine, California and was founded in 1979. 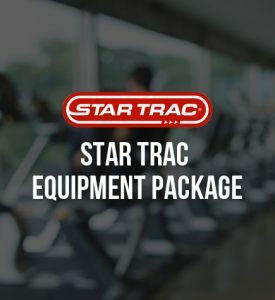 Star Trac has a strikingly adapt name as the equipment truly does have a space aged look and feel. Most of the equipment has fans as well (built in ventilation) and these E-Series models have truly stood the test of time. This commercial gym equipment pairs well with one of our functional trainers or plate loaded free-weight setups. 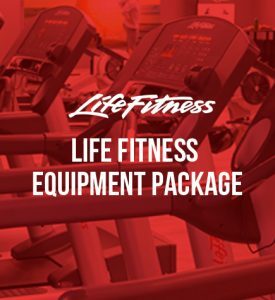 Life Fitness has consistently been one of the most premium commercial gym equipment brands in the fitness industry. They revolutionized exercise with their LifeCycle Upright and Recumbent Commercial Bike 40+ Years ago. If you run a health club, then you’ll know that choosing between commercial gym equipment packages is an important decision. There are so many factors that can vary between suppliers and details that need to be considered. Replacing or installing fitness equipment can be a big headache, especially if it involves closing parts of your facility to members. So, it’s important that any package you choose includes the right product mix, from a trustworthy supplier. The last thing you want is to find that the equipment isn’t quite right for your needs (after you’ve invested all that time and effort in the installation). Or worse still, for them to let you down and cancel delivery plans at the last minute. At Gym Pros, we pride ourselves on our high levels of customer service and reliability. Our commercial gym equipment packages are always customized to each client’s specific needs. We like to get things right the first time but will always make adjustments based on your feedback until we’ve created the perfect gym equipment package for your facility. Personal training studios require altogether different commercial gym equipment packages. You’ll often have a smaller floor space, which requires multi-functional cardio equipment and a personalized free weight package. Unlike health clubs and fitness centers, you’ll be supervising clients on a one-to-one basis, which means you can experiment with equipment that requires more expertise. In fact, many PT clients will expect a higher level of training complexity and guidance in return for their premium fees. This is why our commercial gym equipment packages for studios often include space-saving cardio units like the Adaptive Motion Trainer. Clients can run, climb, or enjoy an elliptical-style workout on the one machine, which means you get the most out of your limited space. Likewise, functional training rigs can be tailored to your facility dimensions, ensuring you get the best usage possible from every square foot. With clever design and built-in storage, you can offer the same range of training as a strength gym in a much smaller space. Our in-house consultants will be happy to guide you through the different options and layouts available. Why Gym Pros for Commercial Gym Packages? Our commercial gym equipment packages include top fitness brands like Precor, Life Fitness, Stair Master, BH Fitness, Matrix and Hammer Strength. We also offer specific gym packages for condominiums, hotels, and health clubs including fitness equipment like treadmills, ellipticals, exercise bikes and strengthh machines. We provide a wide range of equipment and pride ourselves at having the best customer service in the United States. Over the last 2 decades, we have built a large network and are well known in the industry for getting the best deals on our commercial gym equipment packages including both strength and cardio, passing the savings to our clients. When you buy in quantities of 5 units or greater, we are able to be even more aggressive and also save on shipping costs. Call our friendly staff today at 888-502-2348 for design assistance and getting the right gym package for your center.